A kitchen is the heart of the home, but it is often times a little neglected when it comes to the decorating and styling department! After all, it’s a functional space first and foremost so practicality comes first. 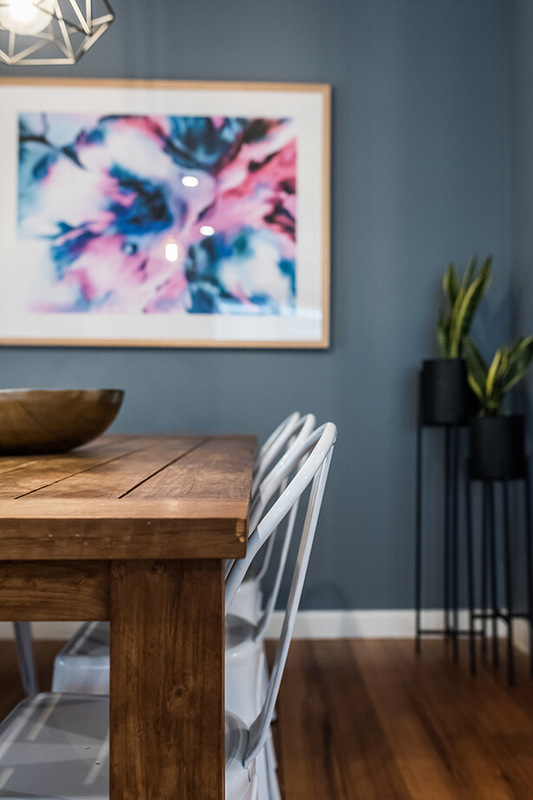 However, that’s not to say there aren’t simple touches you can add to your kitchen and dining space to create a warm, inviting ambience for your family and guests. For Teresa Kleeman from Embracing Space, kitchen design is like second nature. 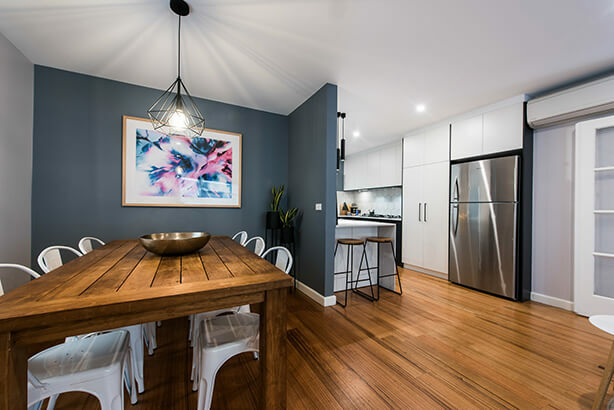 Teresa is a freelance interior designer with over 10 years of industry experience, focusing on kitchen and bathroom design. She recently purchased our Open Stream Framed Print from our showroom for this beautiful kitchen & dining area, tagged us on Instagram and we fell in love with the design… the rest, they say, is history. 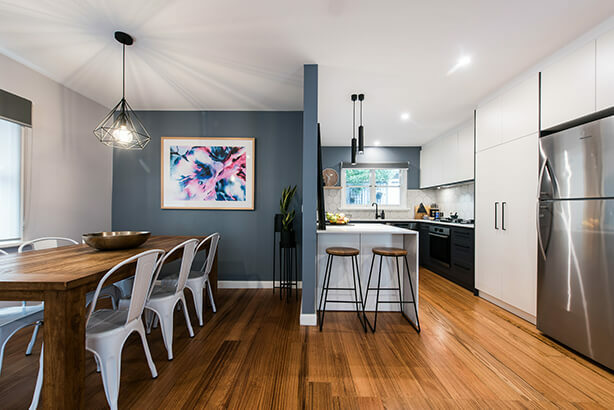 We chatted to Teresa about her recent kitchen/dining design and share her styling tips and tricks with you so you can feel confident to tackle the hub of your home, and create a beautiful space you feel proud to cook and dine in. UI: What was your inspiration for this kitchen design? Were there any challenges you encountered? TK: The original kitchen to this 50’s weatherboard was actually enclosed in its own space which left the living and dining in an odd L shaped arrangement. This made the living area feel small and blocked off from open plan living feel that the clients really wanted. The idea to remove the wall to open up the space so all areas were together was a perfect solution. UI: What was the process for choosing all the furnishings and décor? TK: For this project – the kitchen was the first part we worked on – design and selecting all the finishes. Then we selected wall colours & artwork/ decor in the final selection process. UI: Tell us more about why you chose this art piece for the dining space? TK: I took the clients to the United Interiors showroom to select a wow factor art piece for above their dining table – we wanted something that was going to contrast the Dulux wall colour that we had chosen. We wanted the art piece to be quite large and work nicely with the timber table and white chairs. We fell in love with the colours and the movement in ‘Open Stream’ and knew it would be perfect for the space. We chose the framed print option to create a modernised look and framed it in raw oak. To finish off the space in the dining room, we selected 2 slim matte black planters from the United Interiors showroom to add some greenery in the corner. UI: Can you share some design design tips with us? 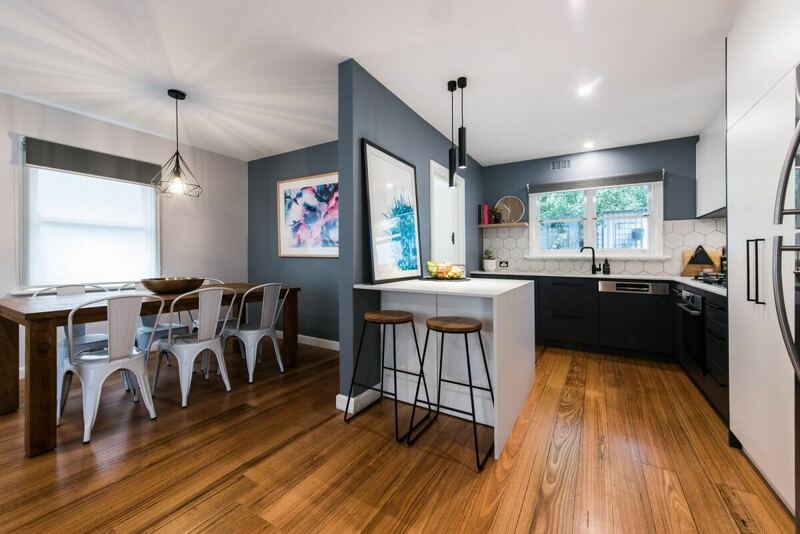 TK: Don’t be afraid to paint walls in your kitchen/living/dining space – it’s amazing what a single wall colour can do to transfer a semi white kitchen – just like this one here. Paint is easy to change – not joinery. Artwork plays a big part in design – it can really give a project what it needs to transfer form a certain space so it is important to select artwork that reflects the space and clients who live there. Teresa Kleeman is a freelance interior designer from Embracing Space. With a special focus on Kitchens and Bathroom design, she offers a holistic service covering all aspects of design including drafting floor plans and elevations, selection appointments for all aspects of domestic building and outdoor living.